is a Quantitative Systems Pharmacology (QSP) platform of immune system and tool for development of QSP and mechanistic models related to immune response. IRT consist of IRT Database and IRT Navigator. The core of IRT Database is IRT Core Model, a QSP model of immune system. IRT Navigator is an application software providing intuitive interface to work with IRT Database. 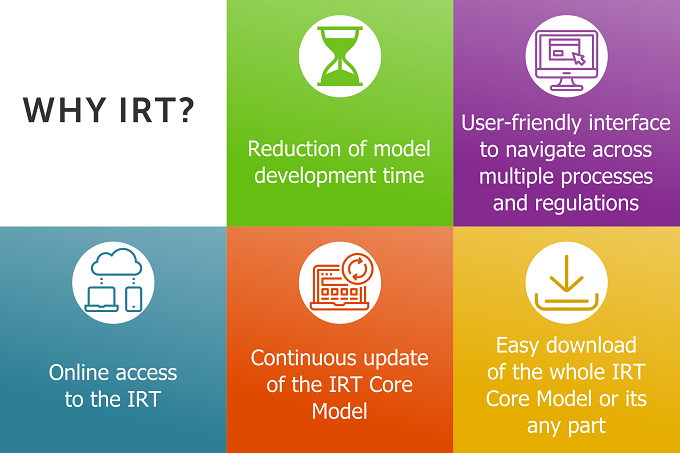 IRT is an innovative tool allowing users to select all or any reactions and species from IRT Core Model and download it. To learn more about IRT please sing up and try demo. IRT Database UPDATE! MDSC (schemes, equations, parameters, annotation): (1) revision of regulation of Mo-MDSC and Gr-MDSC maturation and generation by cytokines; (2) revision of regulation of apoptosis of Mo-MDSC and Gr-MDSC; (3) identification of parameters of cytokines’ effect on MDSC maturation and apoptosis on the basis of in vitro and in vivo data; (4) update of summary of data analysis on MDSC. 308 published articles are used in the IRT as references including 93 research articles from which data were extracted and used for identification of parameters or initial values of variables. General UPDATE! continuous update of IRT Database: significant updates (new schemes, players, in vitro models, etc) 2-3 times per year + regular small updates (identification of new parameters, addition of new data, etc). IRT Database UPDATE! MDSC (schemes, equations, parameters, annotation): (1) introduction of monocytic MDSC (Mo-MDSC) and granulocytic MDSC (Gr-MDSC); (2) new mediators affecting MDSC maturation; (3) direct effect of MDSC on T cells functioning; (4) identification of new parameters. IRT Database UPDATE! CD4 T cells (schemes, equations, parameters, annotation): (1) new state - intermediate; (2) introduction of complexes of different states of CD4 T cells with DC; (3) revision of equations describing effects of co-stimulatory and co-inhibitory receptors on CD4 T cell activation; (4) identification of new parameters; (5) removal of “in vitro” models for CD4 T cells (Th0, Th1, Th2, Th17, Treg) developed in framework of previous version of IRT. IRT Database UPDATE! CD8 T cells (schemes, equations, parameters, annotation): (1) new states - intermediate, exhausted; (2) introduction of complexes of different states of CD8 T cells with DC and Target cells; (3) revision of equations describing effects of co-stimulatory and co-inhibitory receptors on CD8 T cell activation; (4) identification of new parameters; (5) removal of “in vitro” model for CD8 T cells developed in framework of previous version of IRT. IRT Database UPDATE! introduction of cytokines in lymph nodes and tissue (schemes, equations, parameters, annotation). IRT Database UPDATE! surface receptors description (schemes, equations, parameters, annotation): (1) new type of schemes - immunological synapse; (2) new way (in comparison with version 1.0) to describe binding of surface receptors - in framework of particular cell-cell interaction; (3) immunological synapses for CD4 and CD8 T cells vs DC, CD8 T cells vs Target cells, M1 macrophages vs Target cells; (4) identification of new parameters. IRT Database UPDATE! DC (schemes, equations): (1) removal of mDC2; (2) removal of mDC from blood. IRT Database NEW! addition of phenotypes for immune cells (annotation): Gr-MDSC, Mo-MDSC, resting/intermediate/activated CD4 T cells (including Th1, Th2, Th17, iTreg), resting/intermediate/activated CD8 T cells, CD56bright and CD56dim NK cells. 293 published articles are used in the IRT as references including 89 research articles from which data were extracted and used for identification of parameters or initial values of variables. Compartments: blood, blood plasma, lymph nodes, inflamed tissue. Cell types: NK cells, Dendritic cells (DC), Macrophages (M1, M2a, M2b, M2c), MDSC, B cells, CD4+ T cells (Naïve, Th1, Th2, Th17, Treg), CD8+ T cells (Naïve, CTL), Target cells. Differentiation of naïve CD4 T cells in Th1, Th2, Th17 and Treg cells; All these processes are regulated by cytokines and surface receptors. about 200 published articles are used in the IRT as references including about 80 research articles from which data were extracted and used for identification of parameters or initial values of variables. There are “in vitro” models of following immune cells: B cells, CD8 T cells, dendritic cells (DC), macrophages, NK cells, monocytes, Th1 cells, Th2 cells, Th17 cells and Treg.